The prevention and treatment of malnutrition across the continuum of care and into the post-hospital setting represents a tremendous opportunity to improve quality of patient care, improve clinical outcomes, and reduce costs. 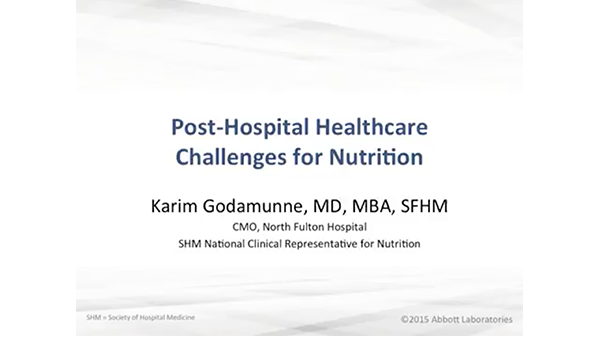 In this Scientific Roundtable, global experts discussed the value of specific initiatives that address malnutrition in the continuum of patient care, and best practices to improve performance, and enhance continuity of nutrition care at transitions of care. The Alliance to Advance Patient Nutrition* is dedicated to raising awareness about the importance of patient nutrition and providing hospitals with resources to advocate for effective nutrition practices. Its mission is to transform patient outcomes through nutrition. Project BOOST (Better Outcomes by Organizing Safe Transitions) provides interventions to improve performance in avoidable readmissions, patients’ wellness, and increasing value for the healthcare system. Malnutrition is a problem that can be solved. Nutrition matters. 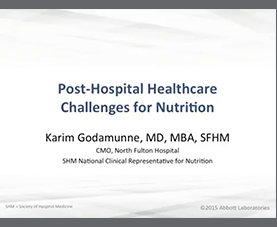 We hope that the presentations from the Abbott Nutrition Scientific Roundtable Discussion on the Integrated Role of Nutrition Post-Hospital Discharge give you the tools to prevent, recognize and treat malnutrition in the continuum of patient care. Take action now in your healthcare practice. *The Alliance represents the Academy of Medical Surgical Nurses (AMSN), Academy of Nutrition and Dietetics (AND), Society of Hospital Medicine (SHM), and Abbott Nutrition.